We are reckoned as reputed Manufacturer, Exporter and Supplier of Jet Screen Printing Machine in Haryana, India. Our Screen Printing Machine is fabricated as per the international quality standards. The machine that we offer can print different kinds of flat objects such as polybag, non-woven bag, sticker and many more. 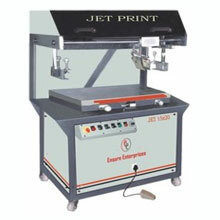 Our Jet Screen Printing Machine is ideal for registration jobs. We provide Screen Printing Machine in different sizes, dimensions and technical specifications. Sizes Available : 15"Ã�20", 18"Ã� 24", 20"Ã�30"